Last edited by Chad; 09-27-13 at 05:41 PM. The ending "reveal" with the wax face is amazing. I appreciated the mystery elements here but with it's remake, House of Wax, and that remake's recent remake (along with Waxwork and other deravitives) it felt predictable. The opening fire scene was cinematic. Glenda Farrell's reporter character was well developed and I enjoyed the "subplot" that everyone treated her like a paranoid conspiracy theorist while she creeps around by herself. For black & white theme day I thought I'd get a jump start on this 1933 subset film only to find it's actually in color. Initially I thought it was maybe colorized but it's genuinely in color with an interesting history to boot as follows. Mystery of the Wax Museum was the last First National feature film under a 1931 Technicolor contract. Warner had already noted the public's apathy with the artificial color system. Technicolor was greeted with hostility by critics and public awash in its unreal hues and humdrum quality control since 1929. The considerable additional expense of the compromised two-color spectrum, which was a fine idea when color was a novelty, was now anathema... Mystery of the Wax Museum was the last studio feature in the two-color Technicolor system. It was also one of the very best, with Technicolor founder Herbert Kalmus declaring it "the ultimate that is possible with two components." ...The process combined red and green dyes to create a color image with a reduced spectrum. Mystery was never reissued formally and over time was considered a lost film. In 1936, Technicolor-Hollywood ceased servicing two-color printing after issuing a "last call" to their customers for prints and converted the final imbibition rig for three-color. The response of most studios was to junk the two-color negatives (which had been stored at Technicolor) of their now-obsolete films. Warner Bros. seems to have kept the negatives for only their two-color cartoons. ...A puzzled letter from screenwriter Ray Russell in Variety reported that the film wasn't lost as far as he was concerned; he had screened the color print at the Warner lot in 1965 while working on the proposed TV series Chamber of Horrors. The then-current library owner, United Artists, copied the film and put it into television distribution, but lab work was so substandard that most of the color was drained away. In 1988, its new owner, Turner Entertainment, made a new, color-correct preservation negative of the movie, allowing it to play theatrical double bills with color prints of the previously restored color version of Doctor X. The laserdisc release was carefully transferred from the 35mm nitrate Jack Warner print (in the collection of the UCLA Film and Television Archives) and retained the essence of its unusual color. 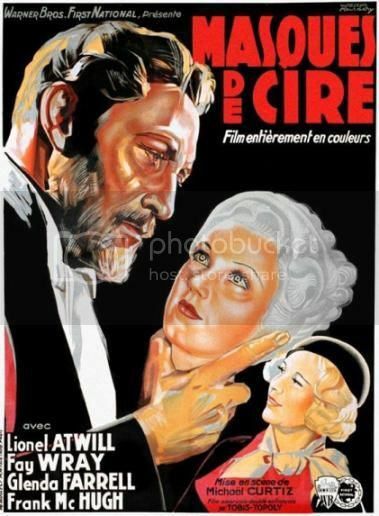 The current video version on DVD (where it was thrown away as a bonus to the Vincent Price remake, House of Wax) and the edition Turner Classic Movies uses is an utterly inaccurate and alarming rendering of the film in shades of blue and pink that bears no relationship to the original color scheme. Last edited by Undeadcow; 10-07-13 at 01:09 PM. I haven't re-watched MYSTERY OF THE WAX MUSEUM yet, but thought I'd throw out a few things before re-watching. I was already very familiar with the re-make, HOUSE OF WAX (1953) (It was one of my favorites when I was a kid, so when I first saw MWM, in the mid-seventies I was expecting it to be like the remake. I was surprised that it was a contemporary film, set in the 30s, rather than at the turn of the century like HOW. I was also surprised that it was such a hard edged film, much darker in tone and having the sub-plot of drug addiction, replaced by alcoholism in the remake. I also liked the wisecracking reporter played by Glenda Farrell. This was a good movie with some really creepy stuff going on. It also shows you that while Universal was ruling the world at the time with its monsters, that the other studios, like WB here, could dish out a good one too. I couldn't help but be pulled in by the screen presence of Glenda Farrell rather than Fay Wray in this one. It also didn't dawn on me until about half way through, when I kept looking at Fay Wray in color, that King Kong was also released in 1933. Not just that, but just TWO MONTHS later. This was in the days the studios were churning out 500 movies a year. Fay Wray had some pretty decent screen time in this and yet Kong came out two months later. Glenda Farrell is quoted on IMDB as saying that she only got Sundays off, but had to sleep almost all day to prepare for the next six days of shooting. And, do you know what else happened in 1933? The Screen Actors Guild was founded to combat some of this craziness. This is one of my favorite horror films from the '30s. I especially love the body-stealing sequence--it's a highlight of early horror for me. And who WOULDN'T fall in love with Glenda Farrell? Watched it on the new HOUSE OF WAX Blu-Ray and it has never looked better! One thing I noticed this time is that there is no background music. This made many of the scenes (the fire, stealing of the body from the morgue) even spookier. Are you talking about the new 3D blu-ray? I've debating upgrading from my snapper case DVD. Huh, yes. I didn't even think of that. Good catch. I was very surprised it was in colour, too, but reading about it - thanks, Undeadcow - was fascinating. Hopefully sometime soon there'll be a "correct" version released properly. Agree with nton. Thanks Undeadcow for the color comments. I honestly thought I was watching a colorization movie since the color looked so poor. This movie was okay but just didn't pull me in like the remake does (though I am not a big fan of the remake either). I thought it was passable (and better than a lot of the average movies I have watched lately) but I never felt gripped by it. I will say that I found the reporters "Dragnet" style of speaking to each other obnoxious. I know that is how many of the early 30's actors say their lines but it just feels so forced and unnatural. I kept feeling like I was watching The Hudsucker Proxy with the fast-talking reporter character. Yep. And HOUSE OF WAX looks great in 3D. Definitely worth the upgrade if you're 3D capable.